It's never been the taste of vegetarian or vegan foods that's kept me from swearing off animal products entirely. It's primarily the cost and lack of availability of viable meat-free alternatives. And although arguments can be made that vegetarian diets may even be cheaper than meatful diets, we're a long ways off from being able to purchase meat-free corn dogs from the average street vendor or chickenless nuggets from the Mickey D's on the corner. That being said, Trader Joe's is one of those rare places where meaty foods and meatless foods are pretty much on a level playing field. There are plenty of options in both camps, and strict vegetarians probably don't feel like they're missing out on all that much. This product is a prime example. TJ's is a great place for meat eaters to discover that Meatless Mondays won't kill them—or that they can be "part time vegans." 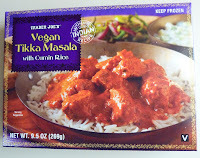 In fact, we've already reviewed a vegetarian tikka masala dish on this blog, as well as a non-vegetarian one. Like the previous two tikka masala dishes, this one has some amazing sauce. It's full of Indian spices and flavor, it's creamy, and it's mildly hot. It's almost as good as masala sauce I've had from actual Indian restaurants. 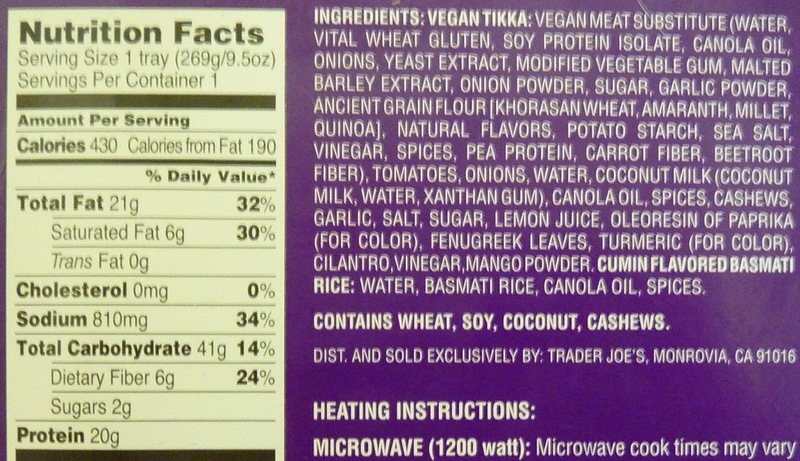 The rice is your basic basmati—the kind we usually see in these frozen Indian dishes from TJ's—flavored with oil and cumin, and as always, it blends very well with the sauce and other elements. 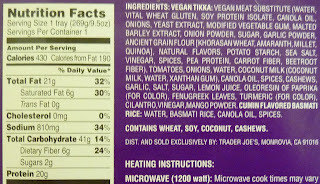 The vegan meat substitute was fairly neutral in flavor, which allowed the sauce to be the dominant taste of the dish. If anything, the vegan chunks tasted just ever so slightly soy-ish, with a breadiness about them as well. It wasn't an unpleasant flavor at all—on the contrary, it was delicate and satisfying, despite a decided lack of potency. Texture-wise, the meatless chunks did a decent job of imitating white meat chicken pieces, if but perhaps a mite bit more chewy—certainly not to the point that I would complain. In fact, I've definitely had actual chicken that was far more rubbery than this on more than one occasion. I should note at this point that I did heat my entree in the microwave, although conventional oven instructions are given. Even though I've become far more proficient at traditional cooking in the past few years, my rule of thumb is that if it comes in a plastic tray with clear film on top, I'll go ahead and nuke it...or if I'm really hungry and don't want to wait the extra 20 minutes. In this case, it was both. 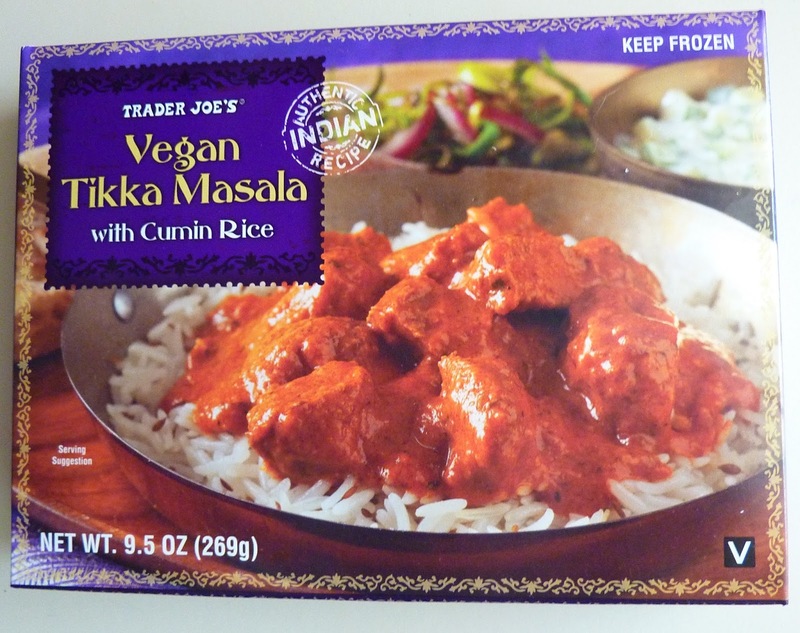 $3.49 at our local TJ's, six minutes in the microwave, and a reasonable calorie count for tikka masala...this gets a thumbs up from me. If you was blindfolded and would you tell the difference between this vegan one and the regular chicken masala? Yes, I would be able to tell the difference. And I would prefer the regular chicken version slightly. I think we gave that one 9.5 stars. But this vegan version isn't bad by any means. The sauce was my biggest concern. 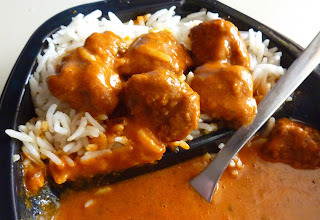 I love the Chicken Tikka sauce, and I don't know how you could make it anywhere as good without yogurt, butter, cream, or milk. Weird that it contains more calories (430) than the regular chicken version (only 360 calories) since it doesn't have all the cream and butter. The sauce is based on coconut milk and cashews, both of which are super fatty. I really like this. I'm not vegetarian but honestly I haven't been impressed with the quality of TJs chicken products. Used to love the Orange Chicken 5 years ago but past times I've gotten it is been way too weirdly stringy, odd hard bits, and "grissley" (which chicken shouldn't have really). So this is great for my tikka masala fix without having to deal with awful quality chicken. Yes. Everybody says the orange chicken isn't what it used to be. Sad. I just tried this and had to stop first bite and look at the box again to confirm it was NOT meat. It was more like a chicken meatball, but I am not familiar with the original chicken Tikka Masala. This is very good and on my regular list now. I'm having it now and it's amazing. The sauce has all the right flavors and a perfect body. The "meat" is surprisingly good! I find it to be more of a meatball than a chickeny chunk but the texture and light flavor compliments the dish very well. I couldn't be happier! I'm newly vegetarian btw- 1 year in April.